Today not an Old Master, movie image or totemic icon but a re-worked image of a classical sculpture courtesy of Dave Brown in the Independent. Less political, more a commentary today. Saturday 18 September. The Independent – Dave Brown/Agesander, Athenodoros and Polydorus. 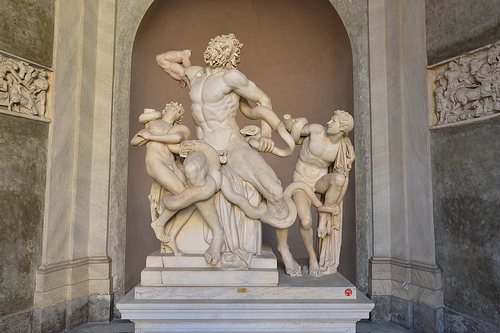 Laocoön had begged the Trojans to set fire to the horse, that the Greeks had left, to ensure it was not a trick. The Trojans ignored him and wheeled the great wooden Horse into the city. Laocoön did not give up trying to convince the Trojans to burn the horse, and Athena makes him pay. She sends two giant sea serpents to strangle and kill him and his two sons. In another version of the story, it was said that Poseidon sent the sea serpents to strangle and kill Laocoön and his two sons. The Greeks inside the horse take the City of Troy. A twist to the imagery of the two subject matters is Laocoön was punished for essentially being right for arguing not to let the Trojan horse in and Obama argued against travel bans from West Africa after being wrongly advised by the Center for Disease Control about the dangers. Attrib. Agesander, Athenodoros and Polydorus, between 27 BC and 68 AD – Marble, 208cm × 163cm x 112cm, Museo Pio-Clementino, Vatican Museums, Vatican City. This entry was posted in Referential Cartoons and tagged Dave Brown, Ebola virus, President Barack Obama on October 18, 2014 by Chris Walker.